Volunteer for committee membership or other opportunities. Click here to submit your interest. 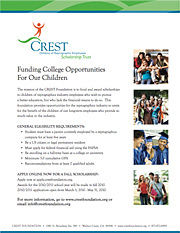 Beginning in late 2008, students who have been selected to receive funds from the CREST Foundation will be identified by their school location. If you are an IRgA reprographer — or an employee of such a reprographer — you may be eligible to help a student acclimate to a new environment, provide part-time employment, community connections, or simply provide moral support to young person who is working their way towards adult hood and a career. If you would like to be considered for such a position, please contact us with your name, and the name and location of your company. We will contact you when and if a position becomes available.